Another excellent opening book from Chess Stars, containing plenty of detailed and original analysis. Let us say you meet 1.e4 with 1…e5 and you’ve got your defence against the Ruy Lopez sorted. Perhaps, when it comes to the Lopez, you avoid 3…a6 altogether and play one of the defences outlined by Ivan Sokolov in The Ruy Lopez Revisited. Or you might play the venerable Steinitz Defence Deferred, as advocated by Timothy Taylor in Slay the Spanish!. Then again, the sharp Marshall Attack may be more your cup of tea, for which see Milos Pavlovic’s Fighting the Ruy Lopez. Never mind, no matter: the Ruy Lopez is sussed and sorted. There still remains, however, the question of what to do against White’s other opening systems, and there are a lot of them. How will you meet the King’s Gambit, the Bishop’s Opening, the Ponziani Opening, the Scotch Game, the Giuoco Piano… and all the rest? Think panacea (well, almost) and you’ll have a good idea of what Igor Lysyj and Roman Ovetchkin’s book is all about: they provide defences to all of the above-mentioned systems, as well as others. They seem to have overlooked Mengarini’s Opening (1.e4 e5 2.a3), but apart from that everything has been covered, even Nakamura’s ridiculous 2.Qh5 and the rarely seen Philidor Reversed (2.Nf3 Nc6 3.d3). As for the author’s repertoire recommendations, there are some interesting choices: Falkbeer’s 2…d5 versus the King’s Gambit; 2…Nc6 (rather than a line involving …c6 and …d5) versus the Bishop’s Opening; and against the Four Knights’ Game (following 2.Nf3 Nc6 3.Nc3 Nf6 4.Bb5 Bb4 5.O-O O-O 6.d3 d6 7.Bg5) the interesting 7…Ne7, an old move revived by Ponomariov. Most attention is paid to the Scotch Game (including the Scotch and Goring Gambits) and the Giuoco Piano (Evans’ Gambit included). 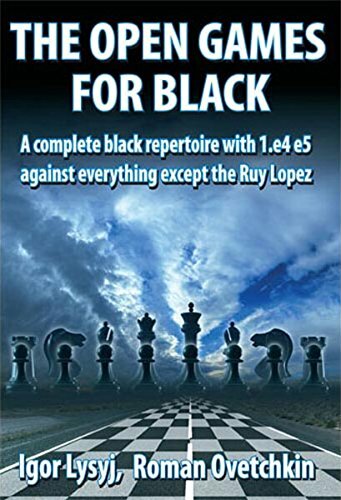 The Open Games for Black is a comprehensive, one-stop shop of defences to openings other than the Ruy Lopez, for those who play 1…e5 as Black. It does a very good and useful job. The Content’s Page of The Open Games for Black is here.